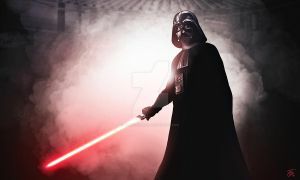 Darth Vader: is over... don't make me kill you!!! Ashoka: only a Sith deals with the absolutes, I will do what I must..
Master and Apprentice, fighting to the death. Only one, can make it out. Amazing job on this. The dark colouring, really helps to showcase the mood of this. I loved this scene and battle! Incredible! I both characters. Great art!!! Impressive, most impressive. Haha I couldn't resist using that Vader's quote, it's fits my view on this great piece of art you have made. Awesome work, really captures how epic their final confrontation was. Well done. I like how another in your comments wanted to blow it up giant size and put it on his wall. Fantastic image. Very beautiful artwork! Very well done! This was an epic battle, captured beautifully. Love the style and intensity. Hi DarthTemoc, I would like to buy a high res digital file of this so I can have it printed and displayed in my home. Please contact me with costs and terms. Holy moly, this is stunning. This is great. I only just watched that episode of series 2 and it was epic, you work really captures the essence of that confrontation. can you post your work in the deviantart shop to be printed on canvas? Am I the only one who thinks the Kyloish unstablelooking light saber blades look cooler than the normal ones. I wouldn't say they look cooler but I do think they look cool. Can I use this for a film I am making? I like how vague everything is and feels like it is in motion, but still detailed. The characters feel ready to jump off the page. A desperate rogue faces the ghost of her former mentor. An untraceable blur facing an inexorable phantasm. So much at stake. So many emotions with each stroke and step... The fight is sheer poetry in motion. A very epic fight despite how short it really was. Favorite part was the end of it. 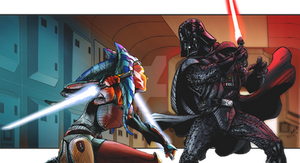 Yes, an epic finale and expect this battle to happen, Ahsoka fight against her former master turned Sith Lord. I believe that's referred to as an unstable beam. Don't give that whiny brat's name to something so cool. Besides, I think that has more to do with the artist's aesthetic style. My heart is broken. Does earth have enough ice cream for me? Ur not the only one. I do too.